Crystallography is great. I love it. The reason that I love it is that it is to my mind one of the most powerful techniques we have at our disposal for getting mechanistic detail about how life works at a molecular level. Biological crystallography allows us to determine the precise three dimensional structure of biologically relevant macromolecules – like proteins and DNA, but also small molecules such as ligands and metabolites necessary for life to thrive and survive. 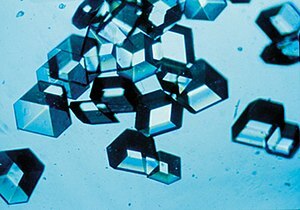 As the name suggests, crystallography requires the growth of crystals. I think that one of the more interesting facets of crystallography is the dichotomy between the very rigorous and precise methods of data processing and model refinement, and the act of crystallising a protein, which is often described as ‘black magic’. Crystallisation is essentially controlled precipitation – the protein comes out of solution in an ordered manner, and forms a crystal lattice. In order to get the protein to fall out of solution in this way, we have to alter the chemical environment of protein by mixing it with different concentrations of buffers, salt and precipitating agents. Crystallisation is now routinely carried out using crystallisation robots – liquid handling machines that make the whole process easier, faster and more repeatable. They also can dispense nanolitre volumes of protein, making the meager amounts of proteins that we have struggled to produce and purify go much further. Initial screening is carried out using screens that can be brought in deep well block format from companies such as Molecular Dimensions and Hampton Research. Labs will have their preferred range of screens and preferred suppliers. FWIW, my first line of attack is to use the JCSG+, Pact Premier, Morpheus and Clear Strategy I & II screens from molecular dimensions. It is the follow-up optimisation of any crystallization ‘hits’ that I want to discuss here. In days of old (~10 years ago) crystallisation was setup on a micro/millilitre scale. We would setup 24-well trays with 0.5-1 ml of well solution, and drop sizes of 1-10µl. Now, with the robots, we setup 96 well trays with ~80µl of well solution and drop sizes of 200-600 nanolitres. When optimising crystallisation hits, one might suppose that bigger drops might be more likely to yield bigger crystals – which is probably true, but the crystallisation conditions do not necessarily scale up in a simple fashion – this is due to changes in the crystallisation setup, such as the ratio of well solution volume to total volume within the experiment and the drop surface area to volume ratio . I will admit that I had previously struggled to make the transition from robot-setup nanolitre-scale screens to hand made microlitre-scale optimisation screens. However, I now would argue that hand-setup drops are no-longer required in routine cases of structure solution. Cases where ligand or heavy atoms soaks are required may still need 24-well plate style setups and whathaveyou. Rather than screen around potential crystallisation hits, I now setup bespoke deep well blocks to screen around them as follows. I setup 16 15ml falcon tubes. A-H (low) and A-H (high). Each set of falcon tubes will contain crystallisation conditions with different extremes of one variable, for a given condition. Let us suppose that I get a hit in 100mM MES pH 6, 20% PEG 3350, 0.2M CaCl2. The first set of variables that we might want to screen are PEG concentration, pH and salt concentration. I would setup 3 sets of falcon tubes as follows. This is a relatively straight forward setup for fine screening of crystallisation hits for those of us without really big liquid handling robots that make up your own screens from stock solutions**. You can also incorporate increasing amounts of additives such as cryoprotective agents or perhaps ligands into screens as well, although I tend to use column 12 for screening a couple of low concentrations of cryoprotective additives – e.g. 1% and 5% (v/v) of Ethylene Glycol, Glycerol, MPD and PEG400 – in the base conditions. I find that this setup is extremely useful as the deep well block can be stored in the fridge for several months (if properly sealed) and used to screen successive batches of material or perhaps to screen point mutants, (that may or may not crystalize in the same conditions, depending upon how lucky you are 😉 ). You get the benefit of bespoke optimisation screens with fine gradients AND the reproducibility, ease and low protein use of a robot. This obviously works best for a system like the Art Robbins Pheonix robot (my weapon of choice) where the crystallisation screen is dispensed into the crystallisation tray by the robot. Another benefit of this system is the ease at which one can obtain rudimentary phase diagrams, if you use a crystallisation plate with 3 drops per well (I use Art Robbins 3-well intelliplates) and set up screens with 3 different protein concentrations, you will generate data which allows you to create such a phase diagram. More often than not, this optimisation can yield crystals of the sizes required for routine synchrotron data collection (i.e. >100µm along at least one edge), thus rendering the stock of 24-well plate gathering dust in the corner of the lab pretty much obsolete. Clearly, there will always be occasions when a larger crystallisation drop is necessary, but on the whole, I believe that simple fine screening done like this is sufficient for most structure determination efforts. *other crystallisation methods are available. This is the first time I have posted about work and technical aspects of it on my blog – I didn’t think that this method would merit a write up as a technical note in a journal, and as far as I know, most labs might be doing this already. However, I have found this technique to be very successful and easy, and so thought it might be beneficial for some to post it online. If you either already use this setup, or you have used this setup after reading it here and it was successful or not, please post below and give me feedback! University of Manchester! Y U host Psychic? Why is a top five-rated UK university with recent Nobel prize wins for research staff hosting a Psychic Night at one of its conference centres? 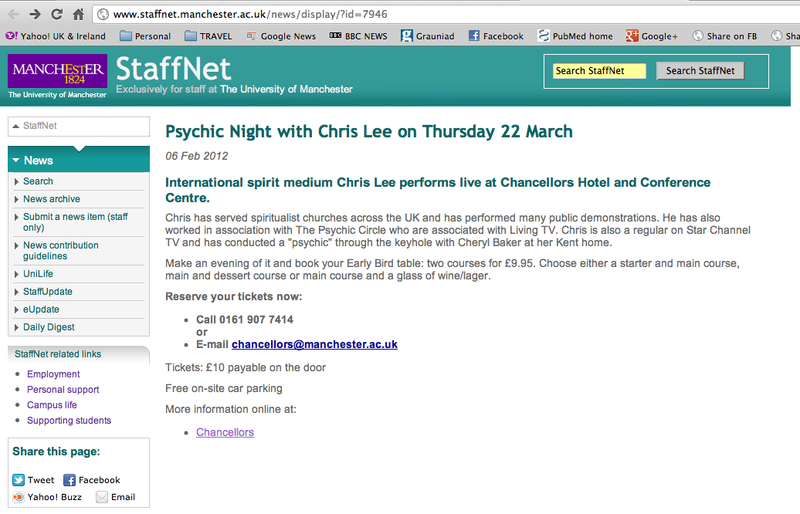 I know times are hard in the HE sector, but UoM is an esteemed centre of learning, not some dodgy two-bit end-of-the-pier show. Still, given that there is zero/zilch/nada/none credible evidence that there is “life after death”, or that certain people can communicate with the dead, should an academic institution with the credibility of UoM give oxygen to this brand of charlatanry? Hat tip to @Andrew_Taylor for pointing this out. 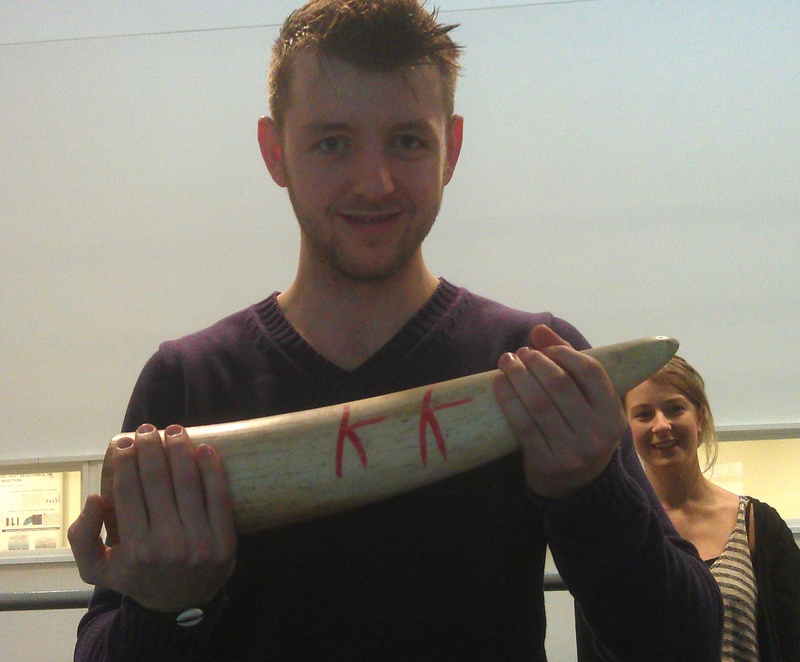 You are currently browsing the Anomalous Distraction blog archives for February, 2012.